This classic type of rye bread spicing forms the basis of our ‘Vitality Bread' philosophy, and these nibbles are actually all the rage with the young and the young at heart alike. The obvious reason for the success of these Mediterranean tidbits is that they are equally suited as nibbles or as a side dish. And on the vitalizing front, it should be added that caraway is a natural appetite stimulant - 100% natural crunching fun, of course. Southtyrolean Crispy Bread Grissini 125 gr. - Fritz & Felix 2,70 EUR / 2,16 €/100 gr. Crispy Bread with Spelt & Oat Flakes 150 gr. - Fritz & Felix 2,15 EUR / 1,43 €/100 gr. 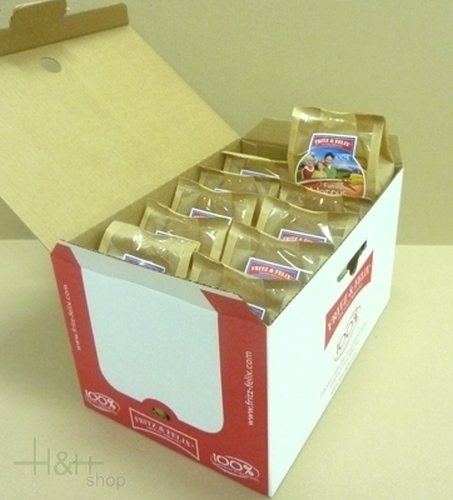 Mini Laugen Grissini Brezel package 10 x 150 gr. - Fritz & Felix 34,35 EUR / 22,90 €/kg.